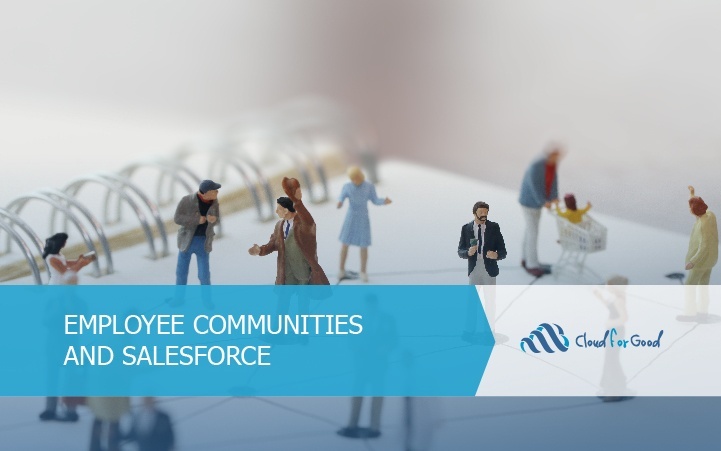 You may have heard a bit about Salesforce Communities as a way to engage with your constituents by providing them with a donor portal, volunteer portal, special event registration, or other function requiring a user account. In Salesforce terminology, these are known as Customer Communities and are meant for an audience external to your own organization. You may not have thought of it before, but what about a Community for your own staff and board members to use? In this article we will look at several ways you can accomplish this. First off, you need to think strategy. What are the ways in which your staff might use a collaboration space? Most organizations already have email, instant messaging, phone, and other methods of communication so why add another? Consider the benefits of providing a communication channel in the context of your database with database records as part of the conversation. Even better, the conversation threads themselves become part of the rich data environment in your CRM. Email can be hard to keep track of over time and important pieces of knowledge can be lost. If these conversations are stored in your database, they can be searched for and accessed at any time. Communities aren’t just for communication alone. Depending on the setup you choose to go with, other people outside of your organization can interact with you. If you’re looking for a way to offer limited access to your database for volunteers, advisory council members, engaged constituents or even partner organizations, Communities are a great fit. Now, you need to consider some specific use cases of an employee or internal Community. What you might use or a Community around is going to depend a lot on what kind of user licenses you’re going to utilize. Understanding the differences between licenses and which Salesforce products they are related to is fundamental to planning out any new Community. Let’s look at three of them and some examples of how each can be used. If you’ve never explored Chatter, we can’t recommend it enough. Chatter is like a discussion forum built into your database. A substantial portion of new Salesforce features are built on or around Chatter including Communities, so for all you admins out there, it’s worth knowing about! Also worth knowing about is the fact that, with your donation of 10 free Salesforce licenses, you also get thousands of Chatter Free licenses. The Chatter Free license allows access to all of the features of Chatter without any access to your database records such as Accounts, Contacts, Opportunities and so on. A space for board members to communicate and collaborate with one another. Note that all of your regular staff who have a standard Salesforce license can use all of the features of Chatter already. They don’t need a separate Chatter Free account. If you want to see an example of a Chatter Community in action, check out the Power of Us HUB. Go to the Chatter tab and explore the community, how posts work, how groups works, and file uploads. Read this article to learn more about Chatter and the details of Chatter licenses and features. Participate in Approval ProcessesNote that Employee Apps does not provide access to Opportunities or Campaigns. Employee Apps users won’t be able to interact with fundraising and marketing activities. Employee Apps is designed to work with Salesforce Community Cloud. Community Cloud provides a way to create a custom tailored experience for your employees and/or constituents. Communities are a website-like layer that sits on top of your Salesforce CRM. With Chatter Free licenses, your users are interacting directly with the same user interface that your admins are. Global search, page layouts, tabs, and so forth look the same. With Communities, you will create a wholly new interface – these users don’t access the administrative user interface of Salesforce at all. Read this article to learn more about Employee Apps Starter license and features. Read this article to learn more about the Partner Community license and features. By now you have a better picture of what’s available in Salesforce to engage your employees in new and creative ways. Yes – there are a lot of choices to make with licenses and implementation methodologies but perhaps the main takeaway here is that you can craft almost any experience that you want for your employees. You have a lot of options outside of assigning a full Salesforce license to everyone, especially if certain staff members have a very targeted and specific sets of things they need to accomplish in the CRM and you want to create a specific interface for them to use.